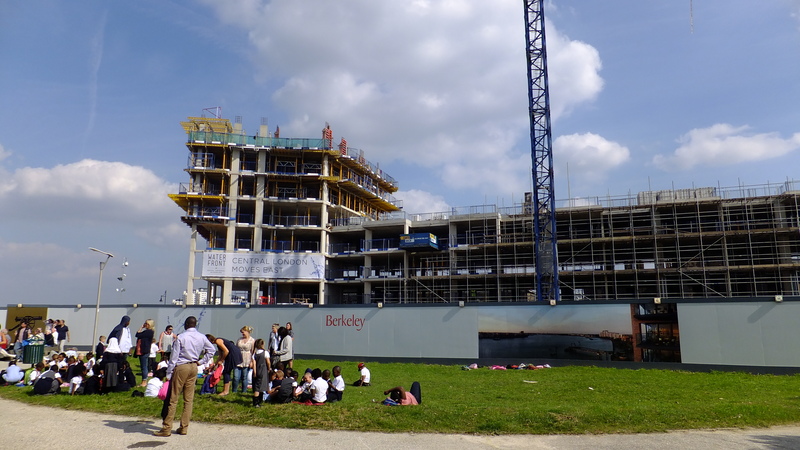 Having not written for a couple of weeks I thought it’s about time I posted, so here’s a post on developments around the Crossrail stations at Abbey Wood and Woolwich. 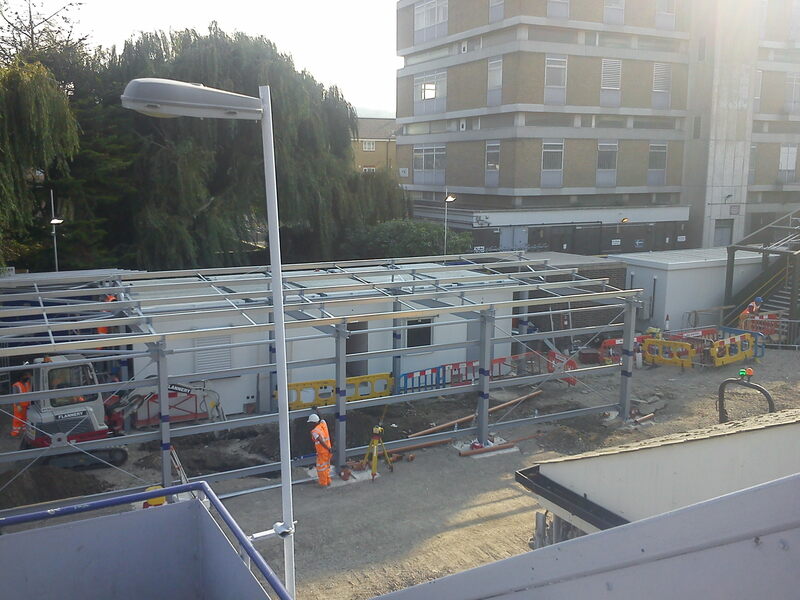 Starting at Abbey Wood and construction at the station is progressing well. It looks like the temporary station will be opening this month, and then the current station will be demolished. It’s a shame to see the current station, dating from 1987, go in some ways as it’s a good design with a bright and airy concourse, and a distinctive, steeply pitched roof. It’s impressive what British Rail managed to do in 1987 when they were operating on a shoe string budget. It does its job well and with a bit of panache with its striking roof. The station at Woolwich Arsenal, from a similar period, is another distinctive design built at a time when funding was a real challenge. 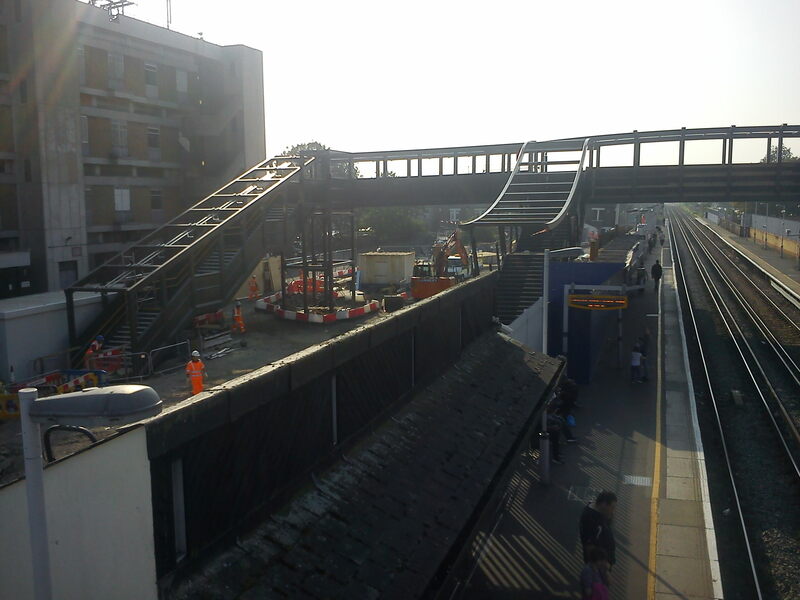 Having said that, Abbey Wood Crossrail station does look to be a good design, as part of a flagship project. It offers good interchange links with buses. My one concern is that it may be putting so much focus on arrivals from buses and the flyover above the station that it ignores people arriving by foot at street level from the main parade of shops to the south, or people coming from the north, of which there will be many more when Cross Quarter completes along with Peabody’s major scheme a few hundreds metres away. 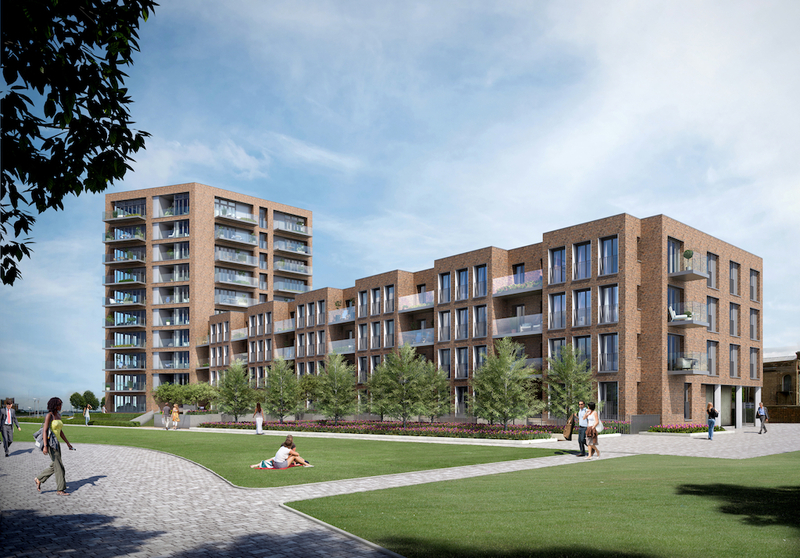 The renders show quite a lot of blank frontages and small entrances. Many of Network Rail’s recent station building designs have been, at best, uninspiring despite being constructed at a time when funding is more plentiful than BR had to play with in their final years. At many recent station developments, low quality materials, clumsy design and cheap modular parts are the order of the day. Dartford is a recent new build that isn’t befitting such a major station with a cheap, chunky and bloated grey canopy. 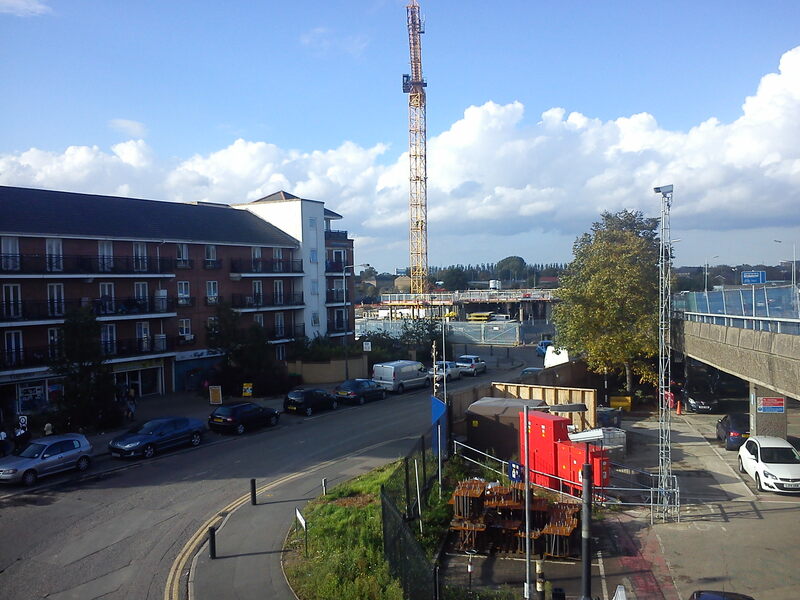 The Cross Quarter development close to the station has broken ground, as seen above. The Sainsbury’s is supposed to open by next summer so I expect rapid progression. The road in front will be altered soon and moved closer to the flyover. Away from there and the streets and public areas in Abbey Wood are still in a terrible, neglected state all over the place. They’re an embarrassment for Greenwich Council and residents. Railings, walls, fences etc are all in a poor state. 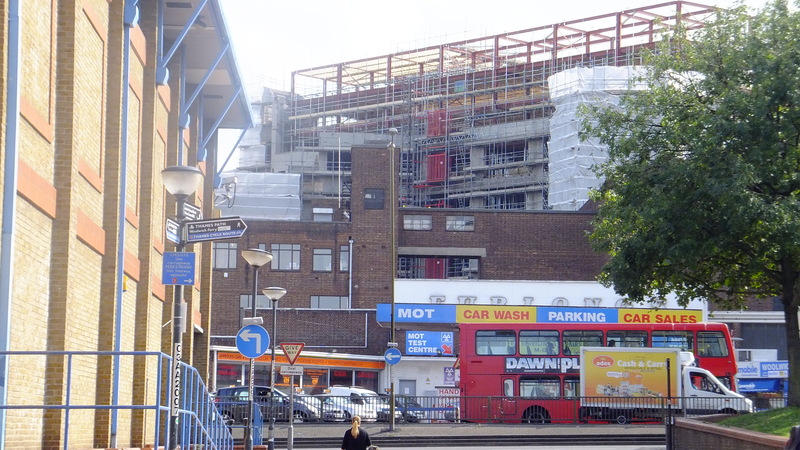 The council and the leaders may bang on about Crossrail and public realm improvements by the station as a fix-all panacea for Abbey Wood, but the problems go far further than 100 metres either side of the station which is the extent of any improvements planned. The thing is, it wouldn’t even take much money or effort to fix the public realm across the area and there’s money coming in from large scale developments to do it. It just needs the council to actually bother and show some interest. It’s not an exaggeration to say nothing’s been done for 20 years. It feels completely abandoned. I have severe doubts they realise the gift they’ve been given with Crossrail and will not take maximum advantage. Not that it should take a massive project for areas to be maintained and improved. 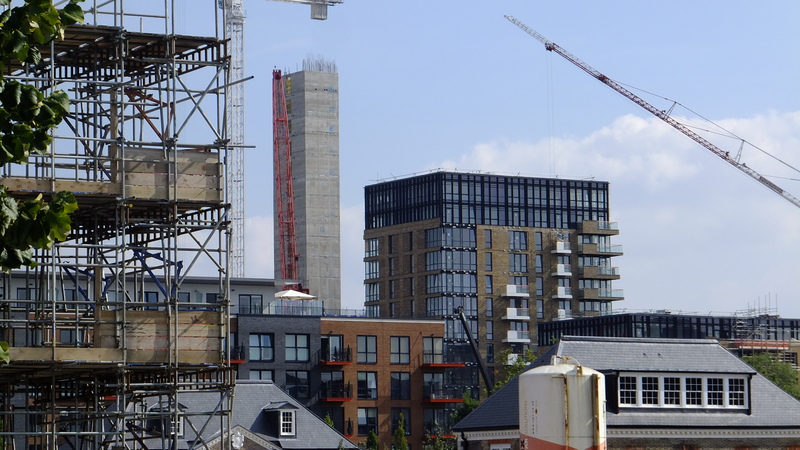 Moving onto Woolwich and some of the towers above the Woolwich Crossrail box have seen their balconies attached. I find them quite clumsy with the buildings looking far more elegant before they were added. Using a brick effect on them does the building no favours. The concrete core of the building next door has topped out at 20 floors. Finally, there is the art deco former co-op department store which mercifully was spared demolition due to the economic downturn. It’s now being converted to flats. It’s hard to get any kind of decent shot of the front looking from the street as it’s covered in sheeting so here’s a distance shot which shows how the building is being raised in height. It would be interesting to know what you think of the outline. Thanks for the heads up – I will have a read. There’s a ton of empty land near there on the DLR construction site. It’s a shame TfL has not done anything with it, and if they’ve sold it then the new owners have just sat on it for years.